An unnamed, fourth Half-Life 2 episode, designed by Warren Spector was in development by Junction Point Studios in late 2005. It was eventually cancelled by Valve and the company was acquired by Disney Interactive Studios in July 2007. The concept, centered around Ravenholm, was passed along to Arkane Studios, who began developing their own project called Return to Ravenholm. 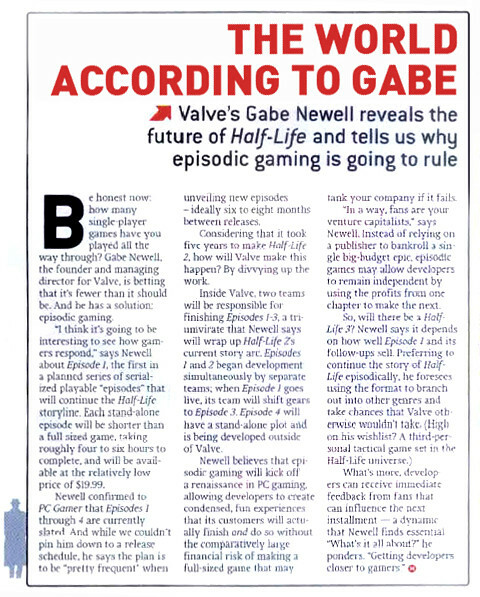 In the May 2006 issue of PC Gamer USA (Issue 148), in an interview with Gabe Newell concerning the future of the Half-Life series, it is revealed that an Episode Four is planned to be released after the conclusion of the Half-Life 2 episodic trilogy. Gabe states that it is to be developed outside of Valve with a stand-alone plotline. In December 2007, Doug Lombardi states that Episode Three will only represent the conclusion of the current Half-Life story arc. It will not be the end of the greater Half-Life franchise, nor the end of the Half-Life episodic series, with even more episodic games unconnected to the current story arc to be made. This relates to the Episode Four mentioned in 2006. That same month, Gabe Newell states in an interview that Valve would like to expand on many elements of the original story that had only been referenced in previous games. In particular, he brings up the possibility of developing games about Alyx Vance or Dog. Junction Point Studios was an independent studio established in November 2004 by Warren Spector and Art Min, the latter of whom had previously worked at Valve. The studio spent much of their time creating concept ideas and attempting to find funding partners. In December 2005, the company announced that it was working with Valve on a new video game project using the Source engine to be delivered via Steam. This was later revealed to be a Half-Life 2 episode that went unfinished. In an interview with Warren Spector in April 2015, he revealed that after several failed deals, Valve had stepped in and saved the company from going out of business. The company did concept development for Valve for about two years while they were doing contract work for Disney Interactive Studios on another project at the same time, later becoming Epic Mickey. The Half-Life title and their other projects were ultimately cancelled, and the company was acquired by Disney. In the same interview, Spector explained that they were working on an episode that would fill in one of the gaps in the Half-Life universe. He described that they were trying to flesh out a specific part of the world of Half-Life. In September 2017, it was revealed that the game was to center around Ravenholm and how it "became what it was in the Half-Life universe." Spector wanted to develop the story of both the town and Father Grigori, shedding light on his origins. A new tool called the Magnet Gun was created for this episode, and several ways to use it were planned. In his AMA session on Reddit, Spector said that the weapon was "entirely different than the Gravity Gun" and that both "would have been super complementary". In late 2017, Spector explained the design of this weapon in more detail; it went through several iterations, but the one he remembers the most was to allow players to "fire a sticky magnetic ball at a surface" making anything made of metal "forcibly attracted to it." He mentioned several gameplay possibilities, such as utilizing the momentum of attracted objects to defeat enemies or block their path, immobilizing robot-like units, or solving puzzle sections involving platforms. On March 24, 2017, the original map files for the Half-Life 2 episodes were leaked by an unknown individual. Among them was a map titled styleguide_ravenholm_01, which appears to be related to Warren Spector's episode. Set in a snow-covered location in Ravenholm, it includes scripted sequences and gameplay features, such as puzzles and combat. It is implied that the player crashes into a warehouse near a train station in a gondola and is woken up by two characters named Duncan (Mueller) and Scooter; both are unique entities (ravenholm_npc_mueller and ravenholm_npc_scooter respectively). The player then helps them fix a valve and leaves the warehouse, taking part in clashes between Combine and Resistance units as he proceeds through the town. Of note is the utilization of "jps" prefixes throughout various objects' properties, an obvious reference to the studio's name, and "magnet" and "magnetization" fields of some entities. On October 31, 2017, ValveTime published Marc Laidlaw's e-mail in which he reveals that Return to Ravenholm is the successor to Spector's episode. He also states that Junction Point Studios didn't get far enough to develop a story for their project; similarly, nor did Arkane Studios. Moreover, in his opinion, Warren Spector's studio didn't stick as closely to the atmosphere of horror as Arkane did; he humorously commented on the addition of a character named Scooter being a "horror of a different sort." Overview of the location featured in the map styleguide_ravenholm_01. Inside the warehouse at the beginning of the level. Inside one of Ravenholm's buildings. This page was last modified on 17 December 2018, at 18:45.